Everyone knows I am kind of a dork about books. Well, brace yourself. Ever since I came home with Jane, I have just been all over the place. My free time and the books I want to read don't really match up. Meaning: I have started about 30 books and finished very few. Well, I did read all of Harry Potter before Christmas but literally I had no time to do anything else. I might not have cleaned my bathrooms for two months. So this year I have made a list. I love lists. 52 books in 52 weeks. All are books I own and have been meaning to read either again or for the first time. Actually, I think The Great Gatsby is the only book I have previously read but I was a junior in high school so does that count? 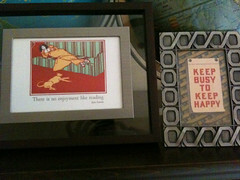 The two quotes above pretty much describe me: "There is no enjoyment like reading" AND "Keep busy to keep happy." So a list, however Type A, makes me feel like I am accomplishing something, even if I am sprawled on the couch. Not too bad. So expect a mini-review every week. This week's pick: The Lost Art of Reading by David L. Ulin. Really short. Mostly because I am determined to get all caught up on household tasks (ahem: cleaning bathrooms) before I spend a whole lot of time on the couch. I just picked up Ulin’s book, but you’ll probably finish it before I do. End of semester. Love your 52 in 52 plan. Love your list! I read 51 in 2010, so I’m determined to read at least 52 in 2011. You have some great books on there. I loved Edgar Sawtelle. Anna and I want to read Toibin’s new short stories, so we may have to join you that week or soon after. Oh, yay, I LOVE this. Can’t wait to read your reviews. I’m glad “East of Eden” is near the top, since I am anxious to hear your thoughts–someone (Danielle?) did their senior paper on it in college and said I needed to read it, and I’m sad that it took me, um, nearly ten years? So good. P.S. Just finished “Jane’s Fame,” btw. Want to read P&P and Emma simultaneously while watching the BBC movie. Loved it. 1st off I love you and your book dorkiness. 2nd I think you read edible birds already, didn’t we read it together? Maybe I just told you to read it. 3rd it looks like I will be there for travels in siberia, do I need to have this read when I get there or would that be too annoying to our other friends? 4th… can not wait to see you and meet jane! oo i should do something like telfer’s doing.. i think i want to try to catch up post march 11 though.